Once you are in Lipsi get ready for a paradise you can call your own. The island is all walkable. Or you can rent motor bikes to explore the island. There are also taxi's and buses that can bring you to other beaches all over the island that run all day long. Captain Giannis Paradissis and his wife Rena have a tour boat business --two boats--the RENA I AND RENA II. The Rena II is mainly for charters. The RENA I runs the 5 island tour daily. 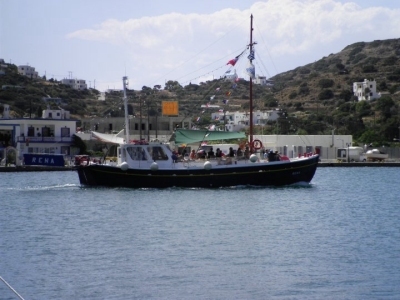 You will leave Lipsi island at 10:30 am in the morning on a traditional Greek boat taking you to 5 destinations. The day lasts from 10:30 am to about 6 pm. You get a full experience of the beautiful Medittarean sea!